When High Point Golf Club closed in 2008, its future was cloudy. Today it’s looking much brighter, but it’s not because of golf or anything else that was a consideration then. That’s because eight years ago, hops farming was barely even a thing in Michigan. As microbreweries increasingly began to dot the landscape, farmers and entrepreneurs across the state saw hops as an enticing and potentially valuable crop. So High Point is now MI Local Hops, to the delight of many, including MI Local Hops CEO Jason Warren. “It is a beautiful day in Hopsville,” says Warren on a bright, warm day in late August. Though indeed there was barely a cloud in the sky, Warren’s words reflected most any day at the farm in Acme Township near Traverse City: No matter the weather, the business climate is sunny, because the explosion in craft brewing has made demand for hops go through the roof. MI Local Hops harvested over 250 acres this year, its first. Among the varieties harvested this season were Centennial, Cascade, Michigan Copper, Chinook, Crystal, Nugget, Willamette and Brewer’s Gold. The first breweries to feature MI Local Hops in this season’s wet hopped ales are Founders Brewing Company (Harvest Ale with Cascade hops), Short’s Brewing Company (Kind Ale with Chinook and Cascade hops), Stormcloud Brewing Company (24:30 with Centennial, Cascade and Chinook hops) and Beards Brewery (Triumphance with Cascade hops). These beers will be on tap for Wet Hop Wednesdays beginning October 12 at 7 Monks Taproom in Traverse City; some if not all will also be available at 7 Monks in Boyne City. 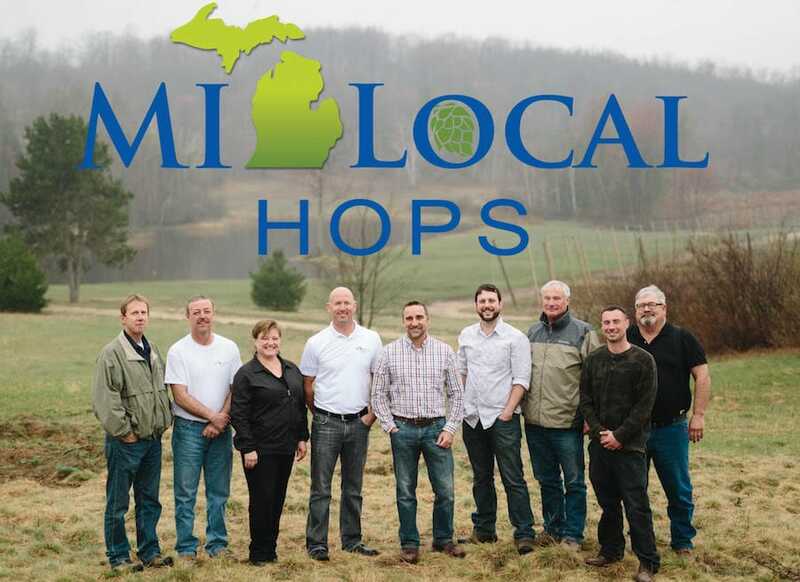 MI Local Hops farm is the largest hop operation east of the Rockies. 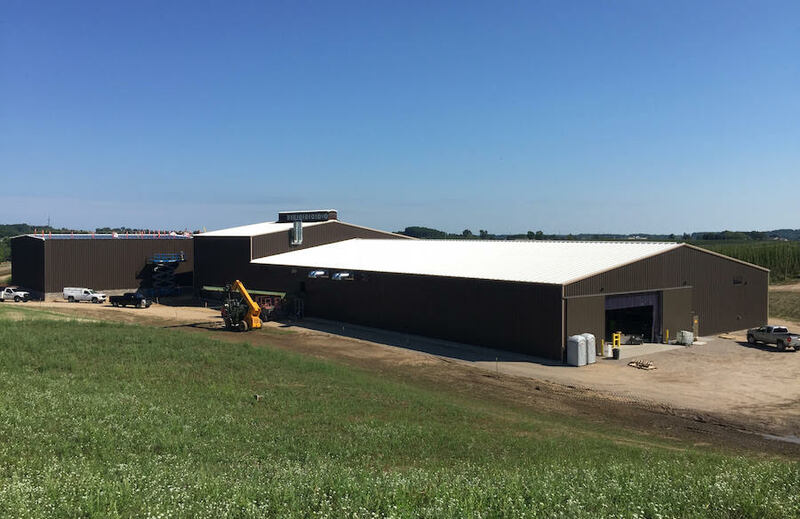 Through a joint venture partnership with Empire Hops, which specializes in custom farming and custom trellis installation, the two businesses managed almost 350 acres and harvested over 250 acres of Northern Michigan grown hops in 2016. The farm is part of a group of investments by MI Local Investments. The principals of the group are Warren, Mark Johnson and Keith Stelter. Warren previously served as the CFO of Shoreline Fruit, and before that he worked as a CPA. He is also a fifth-generation cherry farmer. His multi-faceted background made him a perfect fit as CEO. Mike Moran is the sales and marketing manager for the company. He sees the hops farm growing as more acreage is planted, as well as expanding its footprint in other areas. “We will be opening agricultural tours, but not till fall 2017 at the earliest,” he says. The site will also host events. Already the property has hosted Hops for Hope, a fundraiser for Freedom Builders, which raised $100,000. Converting the golf course to a hops farm did have its challenges. Moran pointed out that they encountered a lot of clay, a less-than-desirable growing medium. On the other hand, as High Point was designed as a links course, there were fewer sand traps and water hazards that needed to be eliminated. He’s also pleased with the way the weather unfolded this summer: Warm and sunny, with enough rain and little damaging wind (as the plants are suspended on strings above the ground, they are susceptible to damage from wind storms). “The weather was very good. Hops are very vulnerable. They love heat and water,” he says. Warren says one of the goals of MI Local Hops is to accelerate the growth of the industry in Michigan. The top hops producing states are Washington, Oregon and Idaho, which produce well over 90 percent of the nation’s crop. Two years ago when Warren went to a hops-growing convention, Michigan was mostly ignored. The next year, the state’s efforts were seen as a curiosity. “This year we were on the map,” he says. Warren and Moran believe they’re on to something. After all, Michigan was a large hops supplier once before. “Hops was big 100 years ago, but downy mildew wiped it out basically overnight,” Moran says. 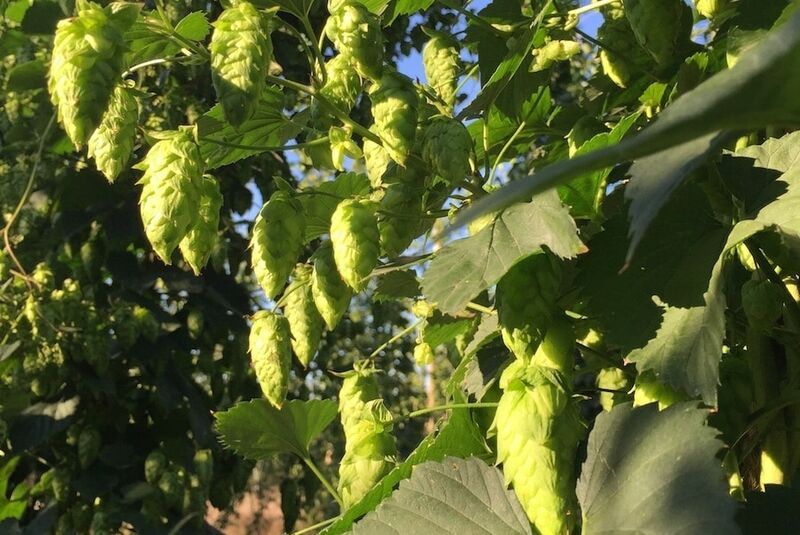 Modern fungicide treatments and the like have mitigated the problem in today’s hop yards, another reason Warren and other hops growers in the region are optimistic about the plant as a new crop favorite. Warren and Moran also believe there’s continued room for growth, particularly as long as the enthusiasm for craft beer continues to grow. Not only is the number of breweries ever-increasing in Michigan and beyond, craft brewers use far more hops in their recipes than do the large-scale commercial breweries. According to Warren, a beer such as Budweiser uses about a third of a pound of hops per barrel. With craft beers, which use hops more for flavoring purposes, the ratio is one and a half to two pounds per barrel. Not only that, but for as much play as the craft beer scene is getting these days, the truth is that the U.S. ranks outside the Top Ten in per capita beer consumption. It’s behind not only expected beer-drinking countries like Germany and Austria, but also Seychelles, Namibia, Spain and Gabon. See video of the 2016 harvest and the MI Local Hops 30,000-square-foot harvesting facility in full operation on MILocalHops.com.